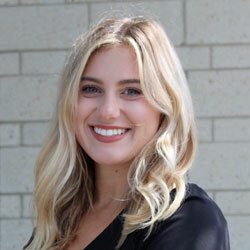 Meet Alyx Hildreth—our optometry office assistant. Alyx joined Premier in 2017 as a technician. Since joining our family, Alyx has grown in her adoration for eye care as well as her enthusiasm to learn more about the practice. Alyx’s responsibilities are modified daily to better meet the needs of our patients and our clinic as a whole. During your office visit, Alyx can be found performing preliminary testing, scribing for our doctors, working with our new contact lens wearers, overseeing medications prescribed by our doctors, or in optical working alongside Tracy. Alyx also oversees some of our social media channels for marketing purposes. Her favorite part of the job is building interpersonal relationships with patients and being surrounded by coworkers that have in time, turned into friends. She strives to deliver an overall positive clinical experience. Alyx graduated from UNC Charlotte in 2016 with a B.A. in health communications. She is passionate about winning over the hearts of people, patients, and coworkers. Her lighthearted disposition and quick wit keep our days in clinic fun and enjoyable. She is a follower of Jesus and a coffee enthusiast. She enjoys all things health and wellness, reading, and traveling to new places with her husband.